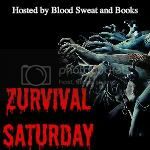 For this week's Zurvival Saturday I want to share the trailer for World War Z and share my feelings about it. This description leaves little to be desired but giving the movie the benefit of the doubt I watched the trailer when it was released. The trailer is good but I admit I have criticized quite heavily the way the Zombies look. Why use CGI zombies when you can just cast a couple hundred extras and duplicate them to make large hordes you know?!? I have hopes that they will still tweak the CGI a bit before release. World War Z if you don't know is based on the book by Max Brooks. From the description of the movie it seems that Brad Pitt's character is trying to stop the infection not just chronicle it in a series of interviews. I'm curious to see how much of the book they actually keep cause right now I feel the only connection is the name. Still in the end I'm a sucker for big budget Zombie goodness and will no doubt see this film in theaters and no doubt I will have a post up the next day either raging or reaping praise over it. I suppose only time will tell how this book translates to screen. Have you read World War Z? If so, How do you feel about the movie? Do you plan on seeing World War Z in theater based on this trailer alone?